Three Rivers Press, 9780761532637, 216pp. Never before has learning to sign been so simple and so much fun! Whether you are a teacher or a parent, this lively self-guided book of American Sign Language (ASL) will quickly become your kids' new favorite teacher! Kids love to sign, whether it be to communicate with a hearing-impaired individual or as a "secret" language with their friends. With this illustrated book they'll quickly and easily become signing superstars! 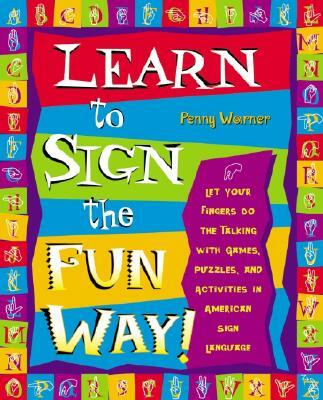 Penny Warner has written over 30 books for parents and kids, featuring ideas on development, parties, games, activities, and snacks. She has a bachelor's degree in early childhood education and a master's degree in special education, and has taught child development, special education, and sign language, at local colleges. She has appeared on several television talk shows as well as on national TV, presenting tips for parents and kids. She was featured on HGTV's Smart Solutions and The Later Today Show. In addition to Learn to Sign the Fun Way, she has written a mystery series featuring a deaf reporter in the California gold country, and is writing a mystery series for middle grade readers. She also wrote a weekly newspaper column for 11 years on family life. She lives in Danville, California, with her husband and two children.